Unlike last night, there would be no late heroics needed this evening as the University of New Brunswick Varsity Reds rolled to an impressive 6-1 victory over the visiting York Lions to capture the Peterbilt Pete Kelly Cup. The V-Reds outscored their OUA opponents 12-4 in sweeping the two game series. After the two teams played a fairly even first ten minutes, the V-Reds started to come on in the latter stages of the period. Stephen Anderson (Halley, Suellentrop) would give UNB the lead with his first of three on the night when he picked up the rebound from a point shot and banged it past goaltender Alex Fotinos at 15:03. Shots in the period ended up 16-9 for UNB. The V-Reds doubled their lead on the power play 4:13 into the middle period when Anderson (Cooper, Brace) scored his second of the game. His original shot from the slot was blocked in front, but he followed up on the play, grabbed the loose puck, and found the back of the net with a wrist shot. The Lions responded with a power play goal of their own - their third in the two games - at 7:57 to cut the deficit in half, however UNB would grab control of the game with a pair of goals shortly afterwards. At 9:21 Anderson (Halley, Clapperton) was the beneficiary of some nice passing in the offensive zone after two Lions collided , tapping in the puck at the side of the net to complete his hat-trick. Just under two minutes later Cam Braes (Halley, Maillet) received the puck in the slot, made a quick deke move, and backhanded the puck between Fotinos' legs for a power play marker. The V-Reds would exit the period with a 4-1 lead after out-shooting the Lions 14-4 in the frame. The final twenty minutes would prove to be fairly uneventful with Philippe Halley (Beauvillier, Petgrave) making it 5-1 at 12:23 after sniping a shot off the crossbar with both teams playing with four skaters aside and Cameron Brace (unassisted) rounding out at 19:02 after getting loose for a breakaway. Shots were 10-6 for UNB in the period. - Peter Trainor and Oliver Cooper drew into the line-up while Chris Caissy and Mike Thomas both sat out. - Shots were 40-19 in favour of UNB. - Anderson (3 goals) and Milner (1 goal) were named the player of the game for their respective teams. - Alex Dubeau got the start in net for the V-Reds and came up with a very solid, if not spectacular, outing. - UNB was 2 for 6 with the power play. The Lions were 1 for 7. - The Varsity Reds took two penalties in the first 68 seconds of the game. They killed of the entirety of a 1:07 two man disadvantage before York took a penalty of their own to wipe out the rest of the 5-on-4. - UNB won 43 out of 69 face-offs with Dylan Willick leading the way with 17 wins on 20 attempts. - Philippe Maillet was named the MVP of the series after collecting 3 goals and 2 assists in the two games. - The V-Reds resume their regular season schedule next weekend with a pair of home games. On Friday night they welcome the St. FX X-Men to the AUC before the Dalhousie Tigers come to town the following night. Both games are set for a 7PM puck drop. The #1 ranked University of New Brunswick Varsity Reds found themselves in a tight contest with the visiting York Lions tonight, but struck for three late goals en route to a 6-3 victory in the first game of the 12th annual Peterbilt Pete Kelly Cup. The Varsity Reds have dominated OUA competition in recent years and it looked like the trend would continue when Philippe Halley (Maillet, Braes) banged in a cross-crease pass from the side of the net on UNB's first shot of the game just 1:41 in. However, just under three minutes later the Lions would even the score after Trevor Petersen made a nice toe-drag around the stick of a defender before ripping a wrist shot past the out-stretched glove hand of Etienne Marcoux and into the top right corner. The V-Reds restored their lead at 15:24 after a lucky bounce off the end boards came to Christopher Clapperton at the side of the net. He quickly found Maillet who put it into a wide open net before goaltender Mack Shields was able to scramble back into position. Braes recorded his second assist of the night on the goal. Shots in the period were 15-6 for UNB. The two teams exchanged goals in the middle frame with the Lions holding a 13-8 advantage in shots. Maillet gave UNB a 3-1 lead at 9:53 with his second of the night after taking a breakaway pass through the middle of the neutral zone from Matt Murphy. York responded late in the period while on the power play to get back within a goal when Tyler Mort blasted in a slap shot from the blue line at 19:36. The Lions knotted the game 4:29 into the third period with another power play goal. Colton Vannucci got the puck all alone in front of the net and fired a quick snap shot between Marcoux's legs. The Varsity Reds would dominate the period, but the score would remain deadlocked 3-3 until the 15:35 mark when Randy Gazzola's (Mignardi, Clapperton) point shot found it's way through traffic. Just 58 seconds later Maillet (Braes) came down the left wing and completed his hat-trick with a snipe into the short side top corner to make it a 5-3 game. The Lions pulled their goalie in a desperate attempt to get back in the game, but the strategy quickly backfired as Francis Beauvillier (Gazzola) won a race for a loose puck in the offensive zone and found the empty net at 17:27 to make it 6-3 and complete the scoring. Shots in the period favoured UNB 20-3. - Oliver Cooper and Peter Trainor were the lone scratches for UNB. - The Lions were missing their top player in defenceman Derek Sheppard. Sheppard, who has 23 points in 18 games thus far this season, is participating in an evaluation camp for OUA players in hopes of representing Team Canada at the upcoming FISU Games. - The V-Reds have added former St. Thomas goalie Luke-Lee Knight as their 3rd goaltender. - Shots in the game were 43-22 for UNB. - Face-offs were 37-26 for the V-Reds. - York scored on two of their three power plays. UNB was 0 for 4 with the man advantage. - Maillet (3 goals, 1 assist) was named the UNB player of the game after continuing his recent torrid stretch. He has 11 points in his last three games. Colton Vannucci (1 goal) earned player of the game honours for York. - The Varsity Reds hit no less than 4 posts in the game. - UNB has now won 35 straight exhibition games against OUA competition. They are on a 47-1-0 streak overall (exhibition + Nationals) against OUA teams dating back to 2004. - The two teams are back at it at 7PM tomorrow night for the final game of the Pete Kelly Cup. - The final U Sports men's hockey top ten rankings of the year were released today and once again the Varsity Reds are in the top spot. UNB received 12 out of 15 first place votes to take top billing for the 8th consecutive week. The Saskatchewan Huskies, fresh off a two game sweep of rival Alberta, received two first place votes to move up to 2nd. The Ryerson Rams picked up the other first place vote and are ranked 3rd, their highest ranking in program history. The Alberta Golden Bears and Mount Royal Cougars - up four spots - round out the top five. McGill, Acadia, Queen's, St. FX - down four spots - and UQTR make up the rest of the top ten. - The York Lions of the OUA West division have been named as the opponent for the upcoming 13th annual Pete Kelly Cup. The Lions currently sit in 2nd place in their division with an 11-5-2 record and sport the 3rd best GAA in the country at 2.11. This should prove to be an intriguing match-up as the V-Reds have far and away the most explosive offense in the country, lighting the lamp 5.33 times per game. The two game series is scheduled for Thursday, December 29th and Friday, December 30th at the AUC. Both games begin at 7PM. UNB and York have played once previously. The two teams met in December of 2003 at the Lakehead Bell Cup with the V-Reds emerging with a 9-1 victory. - It was quite a week for forward Philippe Maillet. Not only was the 4th year veteran awarded the Mark Jeffrey Memorial Scholarship prior to Saturday's game, but he has also been named both the UNB Varsity Reds/Papa John's Pizza Athlete of the Week and the Subway AUS male Athlete of the Week. After going scoreless in back to back games the previous weekend, Maillet was back to his dominant self this past weekend as he registered 2 goals and an assist in Friday's 8-3 win over Saint Mary's and then added another 2 goals and 2 assists in UNB's 5-2 victory over Acadia the next night. Maillet has put together yet another outstanding season thus far. He currently ranks 2nd in the AUS in goals (14), 3rd in assists (18), 2nd in point (32), 1st in +/- (+20), 1st in power play goals (9), and 3rd in shots on goal (70) while playing in all 18 games. - The good news kept coming for Maillet as he, along with teammate Jordan Murray, have been named to the U Sports all-star team that will face the Team Canada Junior Team prospects. The two game series will take place in Blaineville-Boisbriand on Monday, December 12th at 7PM EST and Tuesday, December 13th at 1PM EST. Murray, the reigning U Sports Defenseman of the Year, has elevated his game even further this year as he currently leads the country in scoring amongst defencemen with 9 goals and 19 assists in 18 games. His 29 points put him 5th overall in the country in scoring. The 23 man roster consists of 11 players from the OUA and 6 each from Canada West and the AUS. Other players representing the AUS include goaltender Corbin Boes from Dalhousie, forwards Allain Saulnier from Moncton and Holden Cook from St. FX, and defenceman Geoff Schemitsch from Acadia. Last season the teams split their two games. The U Sports all-start team won the first game 5-4 in a shootout before Team Canada rebounded with a 5-0 victory. - Victor Findlay has posted his latest Tuesday Morning Skate. As we have seen in the past, to beat the University of New Brunswick Varsity Reds you most likely need to A) get a fantastic goaltending performance and B) win the special teams battle. The Acadia Axemen managed both tonight and, as a result, they handed the V-Reds their first regulation loss of the season, 2-1 in Wolfville. UNB falls to 12-1-2 on the season while the Axemen pull within a point of 2nd place with a 9-5-1 mark. - Rob Mignardi (Simpson, McIvor) scored the lone goal for UNB, connecting for a shorthanded marker at 17:15 of the first period to tie the game. - The Axemen received power play goals by Michael Clarke at 11:06 of the first period and Remy Giftopoulos at 9:00 of the middle stanza. - UNB out-shot the the Axemen 39-14, including 28-5 over the final 40 minutes. Needless to say, Axemen goalie Robert Steeves was the difference maker as he came up with a pile of larcenous stops. - The other difference? Special teams. UNB was an almost unbelievable 0 for 11 with the man advantage. This included a pair of 5-on-3 power plays and 7 straight power plays over a 22 minute span between the 2nd and 3rd periods. On the other hand, Acadia was 2 for 9 on the night. - Colin Suellentrop returned to the line-up while Randy Gazzola was out due to an injury suffered last weekend. Cameron Critchlow, Oliver Cooper, and Peter Trainor were also scratched. - The loss snaps a 26-0-2 regular season run by UNB dating back to November 27th last year. Coincidentally, their last regular season loss in regulation time was exactly one year ago today when they fell 7-4 to Moncton. - The 28 game regular season undefeated streak matches the V-Reds best ever. They rang off 28 straight victories between 2008/09 and 2009/10. - Out of UNB's last 23 regular season losses (regulation + OT/SO) dating back to the beginning of the 2012/13 season, 10 have been at the hands of the Axemen. They are only 8-5-5 against Acadia in that span. - The Varsity Reds are 4-6-3 in their last 13 visits to Wolfville. - In other AUS action tonight, Saint Mary's continued their recent hot streak with a 6-3 win over visiting UPEI and Moncton doubled up Dalhousie 4-2 at home. - The V-Reds are back at it tomorrow night when they travel to Saint Mary's for a date against the Huskies. Game time is 7PM. - The Varsity Reds are once again the unanimous top team in the country according to the latest U Sports men's hockey top ten released earlier today. UNB received all 15 first place votes to maintain the top ranking for a 6th consecutive week. They were followed by Saskatchewan, Alberta, St. FX, and McGill, who jumped up a week-high three spots. Ryerson, UOIT, Queen's, UQTR, and Mount Royal, who dropped four spots from last week, make up the rest of the top ten. Acadia and UPEI were the other two AUS teams to receive votes. - Forward Cam Braes has been named the UNB Varsity Reds/Papa John's Pizza male Athlete of the Week. After missing three game due to injury Braes made a triumphant return to the line-up this past week, picking up an assist in a 6-2 win over UPEI on Wednesday and then contributing a career-high five points - including a hat-trick - in Saturday's 9-1 demolition of Moncton. On the season the 5th year native of Shawnigan Lake, BC ranks 5th in the conference with 22 points (9 goals, 13 assists) in only 11 games. - Speaking of Braes, Victor Findlay names him one of his stars of the week in his latest edition of Tuesday Morning Skate. - V-Reds forward Francis Beauvillier talks about his younger brother Anthony in an article by Cory Wright on NHL.com. The younger Beauvillier, who was selected 28th overall by the New York Islanders in the 2015 draft, made his NHL debut earlier this season. The Universite de Moncton Aigles Bleus might have the most dangerous line in the AUS with the Saulnier twins and Jean Francois Plante accounting for 71 points thus far this season, but the Varsity Reds showed that their top unit is just as dangerous as Philippe Maillet, Cam Braes, and Stephen Anderson combined for 12 points in tonight's 9-1 rout in the 1st annual Teddy Bear Toss night. UNB's 8th win in a row gives them a 12-0-2 record, 6 points clear of the 2nd place St. FX X-Men with a game in hand. At the other end of the spectrum are the Aigles Bleus, now 4-9-1 and in last place. Once again the V-Reds came out flying, and almost scored in the first minute when a shot got through goaltender Brandon Thibeau and rolled towards the open net. However, a defenceman was able to pick the puck off the goal line just in time to keep the game scoreless. After a few more close calls UNB finally got the Teddy Bear Toss goal at 10:59 when Cam Braes (Anderson, Murray) jammed in a rebound at the side of the net, triggering a shower of stuffed animals on to the ice surface. After a five minute delay to clean up a truck load of stuffed animals the game resumed and V-Reds would strike twice more before the end of the period. At 15:37 Braes connected again after some nice work by Philippe Maillet. Maillet tracked down a long Marcus McIvor pass just before it reached the goal line for an icing, fended off two defenders, and found Braes all alone in front of the net for a quick snap shot. Maillet (Murray, Brace) then scored one of his own, this time on the power play, at 19:08 when he one-timed a shot from the left face-off circle. Shots in the very one-sided period were 16-2 for UNB. The Aigles Bleus got some momentum to begin the 2nd period when Jean-Francois Plante scored his AUS-leading 16th goal of the year on the power play 40 seconds into the period to cut the deficit to 3-1. The momentum was short-lived though as Plante took a penalty at 6:16 and Mike Thomas (Gazzola) made Moncton pay 36 seconds later when he was the last player to touch a ping-ponging puck in front of the goal. The V-Reds would, for all intents and purposes, put the game away with a pair of late goals 37 seconds apart. At 17:15 Philippe Halley took Matt Petgrave's missed shot off the end boards and banged it in. Rob Mignardi was credited with the secondary assist on the goal. Then at 17:52 Cam Braes (Maillet, Anderson) took a pass from behind the net in the slot and fired it past Thibeau. Shots in the period were 11-5 for the Varsity Reds. The game began to deteriorate in the 3rd period as both teams took a number of penalties and were essentially playing out the string. The Aigles Bleus put in back-up goaltender Alexi Thibaudeau to begin the period but he was unable to slow down the high-flying V-Reds either, surrendering three more goals. Philippe Maillet (Braes, Mignardi) made it 7-1 with his second goal of the night from almost the exact same spot as his first while on the power play at 5:39, Jordan Murray (Braes, Beauvillier) took a cross-ice pass in the offensive zone and picked the top corner, and then, for good measure, Christopher Clapperton (Caissy, Bouden) deflected a point shot for a power play goal with just four seconds remaining. UNB out-shot Moncton 14-2 in the period. - Cameron Critchlow drew back into the line-up, replacing Mark Simpson. Colin Suellentrop, Oliver Cooper, and Peter Trainor all remained out. UNB once again played with only five defenceman. - Defenceman Randy Gazzola left the game late in the 2nd period and never returned. - When Jordan Murray received a 10-minute misconduct to begin the 3rd period, the V-Reds were down to only 3 defenceman for the duration of the misconduct. This forced forward Matt Boudens to slide back and play defence for the period. - Shots in the game were 40-9 for UNB. The V-Reds had as many goals as Moncton had shots on goal. - Alex Dubeau was hardly challenged all night, turning aside 8 out of 9 shots directed his way to improve to 5-0-1 on the season. - All teddy bears collected tonight will benefit the Salvation Army. - UNB's power play continued to be red hot as they went 4 for 6. Moncton was 1 for 5. The V-Reds are now operating at 33% with the man advantage this season. - Braes (3 goals, 2 assists), Maillet (2 goals, 2 assists), and Murray (1 goal, 2 assists) were the three stars of the game. - The V-Reds won 46 out of 85 face-offs. - UNB has out-scored Moncton 27-3 in three game so far this year. - Maillet (25 points), Murray (23), and Braes (22) currently rank 2nd, 3rd, and 5th respectively in AUS scoring. - UNB has now won 10 straight home games over the Aigles Bleus. - The V-Reds are averaging 5.71 goals per game this year. The next best team is Acadia at 3.71 goals per game. - In their last 7 games UNB has out-scored the opposition 42-8. They have not trailed at any point during that span. - Saint Mary's defeated Dalhousie 5-3 in the only other AUS game tonight. - The Varsity Reds head back on the road next weekend when they face Acadia on Friday night and Saint Mary's on Saturday night. Both games are set for a 7PM puck drop and can be viewed online at www.AUStv.ca. The U Sports #1 ranked University of New Brunswick Varsity Reds scored four power play goals en route to a 6-2 victory over the UPEI Panthers tonight in Charlottetown, their 7th win in a row. UNB remains undefeated in regulation time this season as they improve to 11-0-2. On the flip side, the 5th place Panthers have now dropped three in a row to fall to 5-6-2 on the season. The Varsity Reds opened the scoring just past the midway point of the opening period when Chris Caissy (Mignardi, Clapperton) had his quick shot from the top of the left face-off circle partially deflected by a defender. The fluttering puck fooled Panthers goaltender Matt Mahalak just enough to squeeze between his arm and body and into the back of the net. Although the Panthers would receive a 45 second two man advantage a few minutes later, that would prove to be the only goal of the period as UNB out-shot UPEI 10-5. After taking four straight penalties to begin the game, the V-Reds would get three straight power play opportunities in the 2nd period and they would convert on their first two chances to make it a 3-0 game. At 11:22 it was Cameron Brace (Braes, Mignardi) coming in off the blue line and getting the puck all alone on the right side after a tie-up on an offensive zone face-off. Brace skated in and fired a hard wrist shot that beat Mahalak cleanly on the far side. Just under 6 minutes later it was Caissy (Gazzola, Thomas) getting his 2nd of the night after picking up a loose puck at the top of the left face-off circle after a collision between Thomas and two Panthers. He had an open lane to the net and sniped a shot into the top left corner. UNB would take a three goal lead to the 3rd period after a period in which they out-shot the Panthers 15-4. The Panthers scored two goals in the first 4:33 of the 3rd period as they attempted to make a comeback, but that was sandwiched around Brace's (Boudens, Petgrave) second goal of the night at 3:30 as he jammed in a loose puck during a scramble in the crease. UNB would then go on a four minute power play at 11:05 and put the game away with a goals on each end of the double-minor. First, it was Christopher Clapperton (Caissy, Anderson) scoring for the second straight game on the rush at 12:21 and then, just 47 seconds later, Brace (Murray, Maillet) would complete his hat-trick with a one-time from the left side after some nice puck movement and patience in the offensive zone had the defense out of position. That would cap the scoring in this on as the Panthers did hold a slight 9-8 advantage in shots in the period. - Shots in the game were 33-18 for UNB. - Etienne Marcoux turned aside 16 shots on the night in improving to 7-0-1 on the season and 23-2-1 in his career. - Cam Braes made his return to the line-up after missing two games with an injury. Cameron Critchlow, Colin Suellentrop, Oliver Cooper, and Peter Trainor were the scratches. UNB once again played with 13 forwards and 5 defenceman. - The V-Reds special teams were the difference tonight. They went 4 for 5 on the power play and killed off all five of the Panthers man-advantage opportunities. UNB currently leads the AUS in both power play percentage (31.3%) and penalty killing percentage (90.7%). - UNB had a good night in the face-off circle, winning 45 out of 76. - Brace (3 goals) was named the player of the game. - Caissy also had three points (2 goals, 1 assist) while Clapperton (goal, assist) and Mignardi (2 assists) also had multi-point efforts. - UNB is now on a 25-0-2 run in conference play dating back to the final game of the 1st half of last season (November 27th). Overall, they are 35-2-2 against CIS competition since that date. - While UNB still has yet to lose a game in regulation, every other team in the country has lost at least twice in regulation thus far. - The V-Reds have scored 20 more goals than the next best team in the country. St. FX has 52 goals in 14 games and Carleton has 52 in 12 games. Their 1.96 GAA is also tops in the country, edging York (2.05). - In the only other game in the AUS tonight the St, FX X-Men edged the Acadia Axemen 3-2 in overtime in Antigonish. The win ensures the X-Men (10-4-0) remain four points behind the V-Reds while increasing their advantage over the 3rd place Axemen (7-5-1) to five points. - The Varsity Reds are back home on Saturday night for the first time in two weeks when they host the last place Universite de Moncton Aigles Bleus on Teddy Bear Toss night. Game time is 7PM. - The Varsity Reds were the unanimous choice for the top spot in this week's USports men's hockey Top Ten rankings. This marks the 200th consecutive week UNB has been ranked, the 3rd longest streak of all-time behind only Alberta (276) and Saskatchewan (222). Behind the V-Reds were the St. FX X-Men, Saskatchewan Huskies, UOIT Ridgebacks, and Alberta Golden Bears. Mount Royal, Ryerson, McGill, Concordia, and Queen's - ranked for the first time in three seasons - round out the top ten. Acadia and UPEI were the only other AUS teams to receive votes. - Victor Findlay discusses the V-Reds recent winning ways in his latest Tuesday Morning Skate. - Also according to Findlay, a team of USports Hockey selects will face Team Canada World Junior hopefuls for a pair games on December 12th and December 13th in Quebec. It is believed that the roster will be finalized in the coming weeks, although it has been announced that St. FX head coach Brad Peddle will be the AUS representative on the coaching staff. - A reminder that this Saturday's game against Moncton will be the 1st Annual Teddy Bear Toss night. All stuffed animals are welcome and if you don't have one to bring you can purchase one at the game. All stuffed animals go to the Salvation Army. The #1 ranked University of New Brunswick Varsity Reds extended their season-opening undefeated streak to 12 games with a 4-1 victory over the Dalhousie Tigers in a penalty-filled afair tonight in Halifax. The V-Reds are now 10-0-2 on the season and maintain a four point their lead over the 2nd place St. FX X-Men with a game in hand. Meanwhile, the Tigers fall to 5-5-3. The opening period was fairly uneventful until 14:58 when Mark Simpson (Mignardi) got UNB on the board first with their first shorthanded goal of the season. Simpson blocked a shot out near the blue line and was able to retrieve the puck in the neutral zone behind the defence and go in on a breakaway, beating Corbin Boes with a quick snap shot. The Varsity Reds special teams came through again at 19:26, this time on the power play, when Boes made the original save but didn't pick up the rebound right away as it rolled off his left pad. Christopher Clapperton (Murray, Mignardi) was at the side of the net and quickly banged the puck in for the 2-0 lead. That is how the teams would head to the intermission as UNB out-shot the Tigers 10-9 in the period. The V-Reds scored the only goal in the 2nd period to extend their lead. At 5:03 Philippe Maillet skated the puck into the offensive zone and left a perfect drop-pass for Jordan Murray, who took a few strides before blasting a slap shot that beat Boes clean between the legs to make it 3-0. Philippe Halley was credited with the secondary assist on the goal. UNB held a 7-2 shot advantage in the frame. Despite being granted four consecutive power plays to begin the 3rd period - including a 38 second two man advantage - UNB was unable to extend their lead. Then, at 15:57, the Tigers finally broke through, ending Alex Dubeau's shutout attempt when Jackson Playfair scored from the side of the net after an offensive zone face-off win. That would be as close as the Tigers would get, however, as Randy Gazzola iced the game with a shorthanded goal from the neutral zone into an empty net at 18:28. Shots in the period were 12-7 for UNB in the game. - Oliver Cooper drew back into the line-up, replacing Cam Critchlow. Cam Braes (injury), Colin Suellentrop (injury), and Peter Trainor all remained sidelined. - Shots in the game were 29-17 for UNB. - UNB was 1 for 10 on the power play while the Tigers went scoreless on nine attempts. - The Tigers held a slight advantage in the face-off circle, winning 34 out of the 67 draws. Philippe Halley led the way for the V-Reds, winning 12 out of 16. - Alex Dubeau wasn't forced to make many big saves, but did what he had to do in improving to 4-0-1 on the season. - Mignardi (2 assists), Murray (1 goal, 1 assist), and Playfair (1 goal) were named the game's three stars. - This was UNB's 20th consecutive win over Dalhousie over the last five seasons. They have also won 11 straight road games over the Tigers. - The V-Reds have now won 5 straight regular season games by 3+ goals. This is their longest such streak since they rang off an incredible 8 straight 3+ goal victories in October and November of 2010. - In other games around the conference tonight the St. FX X-Men rebounded from last night's loss by storming out to an 8-0 lead over the visiting UPEI Panthers in a game that ended 8-4. In Moncton, the Acadia Axemen erased a 5-1 deficit over the final 11:37 before defeating the Aigles Bleus 6-5 in overtime. - The Varsity Reds are back in action on Wednesday night when they travel to PEI to face the Panthers. Puck drop is scheduled for 7PM. They return to the AUC next Saturday night when they welcome Moncton to town on Teddy Bear Toss Night. The USports #1 ranked University of New Brunswick Varsity Reds received three goals from their defencemen as they went into Antigonish and emerged with a emphatic 7-3 victory this evening over the #2 ranked St. FX X-Men. UNB improves their record to 9-0-2 on the season while St. FX falls to 8-4-0. The Varsity Reds came out and immediately took control of the game with an outstanding first period, out-shooting the X-Men 18-4 and taking a 3-0 lead. Jordan Murray (Halley, Beauvillier) got UNB on the board 4:30 into the contest when he flipped a seeing-eye shot through a maze of bodies that beat goaltender Chase Marchand up high, blocker side. They doubled their lead at 13:56 when Matt Petgrave picked up the puck just inside the offensive zone and went for a skate, carrying the puck down the left side and behind the net before circling back up to the point. He then took a wrist shot that Cam Critchlow, screening the goalie in front, deflected just enough of to have trickle it over the goal line. The V-Reds were then given a late power play and Philippe Maillet (Gazzola, Beauvillier) was able to convert with just 8 seconds left in the period when he unleashed a wrist shot from the left face-off circle short side on Marchand. The X-Men looked to regroup during the intermission and dominated play in the early going of the 2nd period, however Etienne Marcoux was up to the task as he made several big saves to preserve the 3-0 lead. After coming up empty on three straight power plays, including a 1:50 two-man advantage, St. FX finally got on the board at 17:06 when Max Iafrate streaked down the right side and blasted a slap shot just inside the far post. The momentum was short-lived, however. Much like the 1st period the V-Reds went on a late power play and once again they came through. This time it was Randy Gazzola (Beauvillier, Anderson) floating a wrist shot from the top of the left face-off circle through traffic - including Mike Thomas, who was providing an effective screen in front - and in for his first goal of the season at 19:42. Shots in the period were 15-12 for the X-Men. UNB extended their lead to 5-1 5:40 into the 3rd period with an almost carbon copy of the previous goal. With Thomas again causing a distraction in front of the goal, Petgrave (Gazzola, Caissy) waited for the screen to form before firing a wrist shot from the point in. After Michael Clarke pulled the X-Men within 5-2 at 7:05, the V-Reds responded just 50 seconds later when Mark Simpson (Anderson) jabbed a bouncing puck through Marchand's legs for hist first career AUS goal. UNB then made it 7-2 at 12:29 after a lengthy shift in the offensive zone eventually resulted in Cameron Brace (Caissy, Maillet) banging in a cross-crease pass. Matt Needham made the score line a bit more respectable just 22 seconds later when he picked up a loose puck during on a goal-mouth scramble in front of Marcoux and deposited it into the back of the net. That would cap the scoring on the night as the Varsity Reds came away with a 7-3 final. Shots in the period were 12-6 for UNB. - Christopher Clapperton saw his first regular season action of the year as he returned to the line-up. Cam Braes missed his second consecutive game and Colin Suellentrop was also out after leaving last Saturday's game early after a hit into the boards. Oliver Cooper and Peter Trainor remained out. - Marcus McIvor left the game in the 1st period after a hard check from behind into the boards resulted in a cut over his eye that needed nine stitches to close. This left UNB with only four defenceman until he returned later in the game. - Final shots were 42-25 in favour of UNB. - Etienne Marcoux improved his record to 6-0-1 on the season. - St. FX was 0 for 7 on the power play while the V-Reds had a big night, going 3 for 8 with the man advantage. - UNB won 39 out the 70 face-offs in the game. - Gazzola (1 goal, 2 assists) was named the player of the game. Matt Petgrave (1 goal, 1 assist) and X-Men forward Matt Needham were the other two stars. - UNB entered the game having lost 5 of their last 6 games in Antigonish. - This is the latest the V-Reds have gone into a season without a regulations loss since 2009-2010 when they started the season 26-0-0. - This is UNB's 4th straight game where they have won by 4 or more goals. The last time they accomplished that feat was during the 2007-2008 pre-season when they defeated St. Thomas 8-1, Brock 5-1, Waterloo 7-1, and Laurier 10-2. The last time it occurred in the regular season was in 1979-1980 when they beat St. Thomas 11-3, UPEI 13-9, Mount Allison 10-5, and Memorial 14-1 in succession. - In other AUS game tonight Dalhousie got another sparkling game in net from Corbin Boes (36 saves) as they defeated UPEI 3-1 in Halifax and Saint Mary's scored five unanswered goals to top Moncton 5-1 on the road. - UNB is once again #1 in the latest USports men's hockey rankings. The Varsity Reds received all but one first place vote to take the top spot for the fourth straight week. Following them are the St. FX X-Men, up one spot, and Alberta Golden Bears, who had the other first place nod and moved up two spots to 3rd. The Saskatchewan Huskies and UOIT Ridgebacks make up the rest of the top five. Concordia, Mount Royal, McGill - ranked for the first time all season, UPEI, and Ryerson round out the top ten. Acadia, who fell out of the rankings, and Dalhousie are the only other AUS teams to receive votes. - Last Saturday night's victory marked head coach Gardiner MacDougall's 500th career win at UNB. This includes 323 regular season wins, 56 playoff wins, 23 University Cup wins, and 98 exhibition wins. He accomplished the feat in only 719 games. - In this week's Tuesday Morning Skate, Victor Findlay discusses Philippe Maillet and Cam Braes along with a host of other men's hockey topics from around the country. - Earlier this week former Varsity Reds defenceman Alex Wall was called up to the AHL's Albany Devils after posting a goal and five assists in his first six games with the ECHL's Adirondack Thunder. However, it appears that he did not see any action with the Devils and has since been returned to Adirondack. The smooth-skating Wall played three seasons with UPEI before joining UNB prior to the 2014-2015 season. In two years as a V-Red Wall had 25 points in 38 games, helping the team win a national championship last season. - A reminder that UNB is on the road for a pair of crucial games this weekend. They face St. FX tonight before moving on to Halifax for a date against the Dalhousie Tigers tomorrow evening. Both games are scheduled for a 7PM puck drop and can be viewed live at www.AUStv.ca. The top ranked team in the country continued their strong play tonight as the University of New Brunswick Varsity Reds rolled over the visiting Saint Mary's Huskies 5-0 at the AUC. The first place V-Reds run their record to 8-0-2 while the banged up Huskies fall to 3-6-1 and remain in 6th place. After a scoreless first period that saw the V-Reds out-shoot Saint Mary's 8-4 UNB really got rolling in the middle period as they scored three times and had 17 shots to only 7 for SMU. At 6:11 Francis Beauvillier (Boudens) drew first blood after skating the puck down the left side and simply winding up and blasting a slap shot from the face-off dot that beat Cole Cheveldave through the legs. Cam Critchlow (Simpson, Petgrave) made it 2-0 at 12:33 with his first goal of the season thanks to some persistence and determination in front of the net. After his original shot was stopped Critchlow dove and jammed the puck past the outstretched arm of Cheveldave. UNB made it 3-0 just over 4 minutes later at 16:40 when Matt Petgrave circled behind the Huskies goal with the puck before finding Philippe Halley in the high slot. Halley quickly worked it down low to Stephen Anderson at the bottom of the face-off circle, and he wasted no time in backhanding the puck into the top of the net. The Varsity Reds salted the game away late in the 3rd period with a pair of goals within 67 seconds of one another. Shortly after coming up empty on a lengthy two man advantage, Dylan Willick (Petgrave, McIvor) pushed the lead to 4-0 at 15:07 when he found a seam in the defense and, after taking a pass just outside the blueline, skated into the offensive zone and snapped a shot in. Stephen Anderson capped the scoring at 16:14 with his second goal of the night after Matt Murphy made a nice jumping play to barely hold the puck in the zone. Murphy then skated in and made a slap-pass to Anderson at the far side of the net and the forward did the rest of the work, making a couple of quick moves to get the puck around Cheveldave. Shots favoured UNB 16-7 in the period and 41-18 in the game. - Cam Braes was out of the line-up after injuring his hand in last night's game with Cam Critchlow drawing back in. Christopher Clapperton (high ankle sprain), Oliver Cooper, and Peter Trainor all remained sidelined. - Defenceman Colin Suellentrop left the game halfway through the 1st period and never returned after a hard hit into the boards. - Etienne Marcoux turned aside all 18 shots he faced, including a couple great chances early in the game, to pick up his 3rd shutout in 5 starts thus far. He is now 5-0-1 on the season with an AUS-leading 1.45 GAA. - Neither team scored on the power play with UNB going scoreless on four opportunities and SMU on three. - Before the game 5th year senior Cam Braes was presented with the annual Rod Pike Memorial Scholarship Award. - AUS leading scorer Philippe Maillet was held off the score sheet for the first time all year. It wasn't for lack of trying though, as he did generate a game-high 6 shots on goal. - The Huskies were playing with only three natural defencemen as injuries to Austyn Hardie, Stephen Gillard, and Mark Trickett, and the sudden departure of veteran Justin Weller, have put them in a tough position and is undoubtedly one of the main reasons they have got off to an uncharacteristic slow start. - UNB has now outscored the opposition 19-1 over their last 10 periods of play (3-0 in the 3rd period against Dalhousie, 6-0 against St. FX, 5-1 against Acadia, and 5-0 tonight). They have a 54-21 goal differential so far this season. - Gardiner MacDougall collected his 500th career win at UNB. This includes 323 regular season wins, 56 playoff wins, 23 University Cup wins, and 98 exhibition wins. He accomplished the feat in only 719 games. - This was UNB's 2nd straight shutout over SMU following their 4-0 win in the University Cup semi-finals last March. - With the win UNB is now on a 27-0-1 run in regular season games at the AUC. They are 40-1-1 at home in their last 42 games overall with the only loss being a 3-2 setback to St. FX in last year's AUS Final. - The five goal margin of victory is the biggest UNB has had against SMU since a 10-3 pre-season victory in 2010. - In other AUS action tonight UPEI handed Acadia their 2nd road loss of the weekend 3-2 and St. FX rallied from a 2-0 deficit to defeat Moncton 4-2 on the road. - Next weekend the V-Reds begin arguably their most arduous stretch of the season with 5 of their next 6 games on the road. On Friday night they are back in Antigonish for a date with the St. FX X-Men and then on Saturday they move on to Halifax for a game against the Dalhousie Tigers. Both games are scheduled for a 7PM puck drop. The AUS-leading and USports #1 ranked University of New Brunswick Varsity Reds extended their undefeated streak to nine straight games to open the regular season with a convincing 5-1 win over the visiting Acadia Axemen tonight at the AUC. UNB moves to 7-0-2 on the season while Acadia falls to 4th place with a 5-4-0 record. The Varsity Reds scored the lone goal of the opening period on their first shot of the game thanks to Mike Thomas and a horrendous Axemen turnover in their own end. An Acadia forward attempted to clear the puck from his own corner by passing it across the offensive zone which Thomas, charging in from the neutral zone, promptly intercepted just inside the blue line before blasting a shot past goalie Brandon Glover. UNB out-shot the Axemen 7-5 in the period. The majority of the offense in this one came in the 2nd period with four goals being scored. The V-Reds managed to extend their lead just 42 seconds into the period while on the power play when Cameron Brace (Murray, Maillet) gathered the puck near the right circle and waited just long enough for a screen to form in front before unleashing a wrist shot along the ice that evaded the traffic and found the back of the net. The Axemen responded only 87 seconds later when a rush up the ice resulted in goaltender Alex Dubeau being taken out of the play after a couple players crashed the net. The puck came out front to Alexander Lepkowski and he had no trouble putting it in to the yawning cage. This was as close as Acadia would get, however, as UNB answered twice more before the end of the period. At 6:35 Stephen Anderson (Willick, McIvor) picked up a loose puck in the crease and was able to sweep it between Glover's legs and then at 16:41 Cam Braes scored the prettiest goal of the night after some nifty passing. Jordan Murray gained control of the puck near the UNB bench after an offensive zone face-off win and quickly zipped it across the ice to Philippe Maillet at the far boards. Maillet then found Braes at the side of the net for an easy tap-in and a 4-1 lead. UNB held an 11-9 shot advantage in the period. Despite trailing, the Axemen were never a threat in the 3rd as they took a total of four penalties in the period. The Varsity Reds took advantage on their 2nd opportunity when Dubeau made a long stretch pass from his own goal up to Maillet at the Axemen blueline. Maillet patiently waited for Braes to split two defenders before feathering him a pass, sending the 5th year senior in all alone. Braes went forehand to backhand, beating Glover up high to give UNB a 5-1 lead and round out the scoring. Shots in the period were 9-6 for UNB. - Francis Beauvillier was back in the line-up after serving his suspension after last Friday night's game misconduct. Cameron Critchlow, Chris Clapperton, Oliver Cooper, and Peter Trainor were all scratched. - Shots in the game ended up 27-20 for UNB, marking the first time they have failed to register at least 31 shots on goal in a game this season. - Dubeau stopped 19 shots to improve to 3-0-1 on the year. - Braes, Dubeau, and Lepkowski were named the game's three stars. - Mike Thomas had an eventful evening. He scored a goal, took three minor penalties, drew another three penalties, and certainly had the attention of the Axemen all game long. He was buzzing around all night and definitely provided a spark and a ton of energy every time he was on the ice. - Attendance was a solid 2140. - UNB was 2 for 8 on the power play. The Axemen were 0 for 8 with the man advantage, which included a 5-on-3 chance in the 3rd period. - The V-Reds held a slight 35-33 advantage on face-offs. - Maillet's three assists give him an AUS-leading 18 points on the season. Murray and Braes are tied for 3rd with 16 points apiece. - This is the third time in four years UNB has been undefeated through their first 9 regular season games. They began the season 8-0-1 last year as well as in 2013-2014. - This is the first time since the 2012-2013 season the Varsity Reds have beaten the Axemen in the first half. They had previously lost 3-2 in a shootout and 4-3 in overtime last year, 4-3 in overtime twice in 2014, and 4-3 in a shootout and 5-1 in 2013. - In other games around the AUS tonight, St. FX defeated Dalhousie 4-1 in Antigonish and Saint Mary's outlasted UPEI 8-6 in a wild one on the island. - Tomorrow night the V-Reds are back on home ice as they welcome the Saint Mary's Huskies to town for a 7PM tilt. - For the 3rd consecutive week, UNB is ranked at the top of the USports men's hockey rankings. The Varsity Reds received 14 out of the 15 first place votes and 149 points overall. There was considerable shake-up amongst the rest of the top ten as no other team maintained their previous ranking. Saskatchewan, St FX, UOIT, and Alberta made up the rest of the top five while Concordia, Mount Royal, Ryerson, UPEI, and Acadia were ranked 6th to 10th. Perhaps the biggest surprise is the absence of the UQTR Patriotes, who are unranked for the first time since the end of the 2013/14 season. This breaks a streak of 42 straight weeks being ranked. - Philippe Maillet, not surprisingly, has been named the UNB Varsity Reds/Papa John's Pizza male Athlete of the Week after his heroics last weekend. On Friday night Maillet scored 4 points - including a natural hat-trick in the 3rd period to erase a 4-1 deficit - before adding the clinching goal in a shootout to lead UNB to a 5-4 win over Dalhousie. He then had two assists in a big 6-0 victory over 2nd place St. FX the next night. - Defenceman Jordan Murray's spectacular start to the season has earned him the UNB Varsity Reds/Valley Graphics male Athlete of the Month for October. Murray, the reigning CIS Defenceman of the Year, is currently 2nd in the conference in scoring with 6 goals and 9 assists in 8 games. - In his latest installment of Tuesday Morning Skate Victor Findlay gives his thoughts about the week that was in men's hockey, including naming Philippe Maillet his AUS first star of the week. - A reminder that UNB is back on home ice for a pair of important games this weekend as they get their first look at the Acadia Axemen and Saint Mary's Huskies on Friday and Saturday night, respectively. Both games are set for a 7PM start. The USports #1 ranked University of New Brunswick Varsity Reds played perhaps their most complete game of the season last night, limiting the #2 ranked St. FX X-Men to only 13 shots on goal in a convincing 6-0 home victory. UNB improves to 6-0-2 on the season and are now four points clear of a trio of teams - St. FX, Acadia, and UPEI - for top spot on the conference. The V-Reds received 1st period goals from Matt Boudens (Halley, Petgrave) at 12:24 and Rob Mignardi (Murray, Brace), on the power play, at 16:18. They made it 5-0 after 40 minutes thanks to goals by Cam Braes (Murray, Maillet), while on the power play at 3:02, Marcus McIvor (Caissy, Critchlow) at 12:37, and Mignardi (Caissy, Petgrave), with his second of the night at 17:16. Cam Braes (Maillet, Anderson) rounded out the scoring with his second of the game at 15:52 of the 3rd period. - Mike Thomas and Stephen Anderson both returned to the line-up. Christopher Clapperton (injured), Francis Beauvillier (suspended), Oliver Cooper, and Peter Trainor were all out. - Shots in the game were 31-13 for UNB with period totals of 12-1, 12-6, and 7-6. - Etienne Marcoux picked up his 2nd shutout of the season. He now has 5 career shutouts, tied for 4th most in school history behind only Travis Fullerton (21), Reg Bourcier (10), and Dan LaCosta (6). - UNB was 2 for 8 on the power play. St. FX was 0 for 6. - St. FX won 40 out of the 75 face-offs in the game. - The three stars of the game were Mignardi, Braes, and Petgrave. - This was UNB's most lopsided victory over St. FX since a 9-3 win at the AUC on November 13th, 2009. - This game also marked head coach Gardiner MacDougall's 400th career non-exhibition win while at UNB, the most ever by an AUS coach. This includes 321 league wins, 56 playoffs wins, and 23 University Cup wins. His overall record currently stands at 400-156-20 over 16+ seasons at the helm of the V-Reds. - MacDougall also has a career record of 98-39-4 in exhibition games, leaving him just two wins shy of 500 total victories. - With the Ryerson Rams losing 5-3 to Carleton on Friday night, UNB is the last remaining team without a loss in regulation. - In other games around the AUS last night, UPEI defeated Dalhousie 1-0 at home despite holding a 49-15 shot advantage and Acadia got past Moncton 5-3 on the road. - UNB is back at the AUC next weekend for another pair of tough games. On Friday night they face the Acadia Axemen and on Saturday night Saint Mary's is in town. Game time is 7PM for both contests. Tonight was a perfect example why you should never leave a game early. Philippe Maillet scored a natural hat-trick in the last 8:39 of regulation - including two goals in the final 76 seconds - to tie the game before clinching it with another in a shootout to give the University of New Brunswick Varsity Reds an unlikely 5-4 victory over the visiting Dalhousie Tigers at the AUC. UNB remains in 1st place with a 5-0-2 record while the Tigers move into sole possession of 3rd at 3-1-3. The Tigers jumped out to a 2-0 lead in the opening period with goals only 93 seconds apart. At 12:00 Colton Parsons was stationed at the side of the net on the power play and was able to jam the puck in as goaltender Alex Dubeau wasn't able to hold his leg against the post. Then, at 13:33 Kelly Bent appeared to surprise Dubeau when he quickly snapped a loose puck through traffic and past the V-Reds goalie. That would prove to be the end of the night for Dubeau as he was replaced in the crease with Etienne Marcoux. UNB cut into the lead at 18:41 on a 5-on-3 advantage when Jordan Murray (Maillet, Brace) ripped a slap shot into the top left corner just after the first penalty expired. That is how the period would end as UNB held a 10-8 shot advantage. Things would go from bad to worse for the V-Reds in the 2nd period as the Tigers added a pair of power play goals to extend their lead. At 12:51 Myles McGurty took a nice cross-crease pass and put it upstairs to make it 3-1. Then at 14:07 frustrations started to boil over and led to Francis Beauvillier getting ejected. Beauvillier went down in obvious pain after taking a slash to the hand away from the play, but was called for diving. As he made his way into the penalty box Beauvillier expressed his displeasure by swinging his stick at the glass, causing the pane to shatter all over the ice. This prompted the ref to hand out another minor penalty and game misconduct, as well as delaying the game while the rink staff worked to clean up and replace the broken glass. It was starting to look like it just might not be the V-Reds night a few minutes later when they were assessed a delay of game penalty, giving the Tiger an extended 5-on-3 advantage. It only took 34 seconds for defenseman Jesse Lussier to convert, giving Dalhousie a 4-1 lead that they would take into the 3rd period. Shots were 15-9 for UNB in the period. The V-Reds were given two power plays early in the 3rd but were unable to do anything with them and things were really starting to look bleak. Then Philippe Maillet took over. UNB received another power play opportunity at 10:00 and Maillet (Murray, Braes) made them pay when he fired a shot from the slot through traffic that found the back of the net. With Lussier off for a delay of game penalty - and Marcoux on the bench for an extra attacker - the same trio hooked up again at 18:44 when Maillet's wrist shot beat Tigers goalie Corbin Boes through the legs to make it a one goal game. Once again the V-Reds pulled Marcoux and Maillet completed the frantic comeback - and natural hat-trick - 39 seconds later when he unleashed another wrist shot, this time from the left face-off circle. The teams would head to an unlikely overtime after a period in which UNB out-shot the Tigers 17-6. UNB had a golden opportunity to win the game in the 3-on-3 extra session as they were awarded two different power plays. Despite having the man advantage for 3:47 of the five minute overtime, and taking all five shots in the period, the V-Reds could not beat Boes and the two teams went to a shootout for the second consecutive weekend. However, on this night the shootout was a little less dramatic than the one last Friday. After Cam Braes and Fabian Walsh both came up empty, Cameron Brace put one five-hole to get UNB on the board with what would prove to be the game winner. Marcoux then stopped Andrew Wiggington before Maillet capped off his heroic night by beating Boes for the 4th time, clinching the win in the process. - Oliver Cooper was in the line-up for UNB as Christopher Clapperton, Mike Thomas, Stephen Anderson, and Peter Trainor were all out. - UNB was 3 for 8 on the power play. The Tigers were 3 for 6. - Dubeau gave up 2 goals on 8 shots while Marcoux stopped 13 out of 15 shots as well as both shootout attempts he faced..
- Shots in the game favoured UNB 47-23. - UNB won 49 out of 83 face-offs. - Maillet (3 goals, 1 assist), Brace (1 assist), and Murray (1 goal, 3 assists) were named the game's three stars. - Maillet had a game-high 9 shots on goal. - Philippe Halley was wearing an 'A' for the game. - Beauvillier will most likely be out for tomorrow night's game after picking up a game misconduct. - UNB has now won 19 straight home games, as well as 19 straight games overall, against the Tigers. - The V-Reds are 24-0-1 in their last 25 regular season home games. - Elsewhere around the AUS tonight St. FX traveled to Charlottetown and escaped with a 2-1 win over UPEI and Acadia got past Saint Mary's 8-3 at home. - Tomorrow night UNB welcomes the X-Men to town for a big match-up between the top two ranked teams in the country. The V-Reds will be looking to avenge the 5-4 overtime setback they suffered in Antigonish last Saturday. Game time is 7PM. - Last Thursday the CIS announced it is rebranding and will now be known as USports. Opinions regarding the change seem to be mixed thus far. - On Tuesday night the 2015-2016 National Champion Varsity Reds were presented with their championship rings during a special ceremony at Kingswood. A total of 42 rings were handed out to players and staff. The rings - created by Josten's with help from coach Rob Hennigar - feature the UNB logo across the University Cup on the top with one side showing the name and number of its owner and the other side paying homage to the history of the program with six championship banners located above the old Red Devils logo. Last season's 37-6-3 record is acknowledged just below. - The latest USports Top 10 shows UNB maintaining their number one position, although the gap between them and the number two ranked St. FX X-Men closed some after Saturday night's X-Men overtime victory. Saskatchewan remains 3rd while Mount Royal, up four spots, and UOIT make up the rest of the top five. UPEI is the only other AUS team to make the rankings coming in at 8th, although Dalhousie also received votes. - Philippe Halley has been named the UNB Varsity Reds/Papa John's Pizza male Athlete of the Week. Halley notched a goal and two assists over the two games last weekend. - In his weekly column Tuesday Morning Skate, Victor Findlay discusses the V-Reds goaltending situation as well as this Saturday's big rematch between St. FX and UNB at the AUC among many other topics from around the country. Holden Cook scored four goals, including the overtime winner, as the St. FX X-Men defeated the visiting Varsity Reds tonight in Antigonish. UNB falls to 4-0-2 on the season while St. FX improves to 4-2-0. It was a tightly contested game throughout, with neither team enjoying more than a one goal lead. Scoring for the V-Reds were Rob Mignardi and Philippe Halley in the 1st period and Marcus McIvor and Philippe Maillet in the 3rd period. - Shots in the game favorited UNB 32-18. - Etienne Marcoux suffered his first loss of the season in goal. - Matt Petgrave was back in the line-up, replacing Mike Thomas. Christopher Clapperton, Peter Trainor, and Oliver Cooper all remained out. - The Varsity Reds are back home next weekend when they battle the same two teams they did this weekend. The Dalhousie Tigers are in town on Friday night with the X-Men coming in the following night. Game time for both contests is 7PM. For the second time in three road games the University of New Brunswick Varsity Reds were pushed to a shootout, but this time they emerged victorious, eking past the Dalhousie Tigers 5-4 in Halifax in a game they led on three separate occasions. UNB remains undefeated in regulation time at 4-0-1 while the surprising Tigers fall to 2-1-2. After a scoreless opening period in which UNB out-shot the Tigers 17-7 things really opened up in the middle frame with both teams finding the back of the net three times each. The Varsity Reds got on the board first just 2:55 into the period after some nice puck movement. Mark Simpson took a pass from the blue line in the slot with his back to the net and fed Randy Gazzola, who skated in from his defense position and snapped the puck past goaltender Corbin Boes. A Tigers penalty just after the goal sent UNB to the power play and they were able to convert at 4:09 when a Stephen Anderson shot created a big rebound to the opposite side of the ice that Philippe Maillet jumped all over, doubling the V-Reds lead. However, as they did all night, Dalhousie fought back to tie the game. At 6:51 Colton Parsons one-timed a shot from the slot to bring the Tigers within a goal and then Tanner Williams redirected a point shot from the high-slot while on the power play to knot the game at 15:41. UNB didn't waste too much time to regain the lead though, as Francis Beauvillier (Gazzola, Braes) snapped home a power play goal from the right face-off circle at 17:53. The lead was short-lived as last season's top goal scorer Phil Gadoury responded with a power play goal of his own when he one-timed a cross-ice pass from from just below the left face-off circle that went through the legs of Alex Dubeau with only 18 seconds remaining in the period. The two teams would head to the locker room tied 3-3 after a period in which the Tigers held a 10-9 shot advantage. The Varsity Reds took their third lead of the game at 7:46 of the final period with another power play goal - their third of the game. This time it was Rob Mignardi, who was stationed just outside the crease, deflecting a Jordan Murray point shot past Boes. Matt Murphy was awarded the secondary assist on the go-ahead goal. The Tigers tied the game for a third time at 12:09 when Andrew Wiggington made a nice toe-drag to get past a defender before snapping the puck in from the hash marks, Despite constant pressure from UNB the rest of the period the game would head to overtime tied 4-4. Shots were 15-4 for the V-Reds in the period. UNB took 5 out of the 7 shots in the 3-on-3 overtime, but it was fairly uneventful overall and the teams went to a shootout. The V-Reds went first in the shootout and Jordan Murray was stopped by Boes. Gadoury was first up for the Tigers and found the back of the net before Francis Beauvillier came up empty for UNB. At this point the next three shooters all had to go UNB's way and that is exactly what happened. Dubeau stopped Felix Page to give Cam Braes a chance. Braes, needing to score to extend it, came through with some nifty stickwork to tie it at 1-1. The Tigers had another chance to win it but Dubeau once again came up big, stopping Fabian Walsh. Phillip Maillet put the V-Reds on the cusp of victory with a goal but that was quickly answered by Andrew Wigginton. Finally, Cameron Brace snapped a shot in and Dubeau secured the win by stopping Alex Pawelczyk, giving UNB a 5-4 victory. - UNB was without Christopher Clapperton, Matt Petgrave, Peter Trainor, and Oliver Cooper. - Shots in the game ended up 46-23 in the V-Reds favour. - Alex Dubeau made 19 saves to improve to improve to 2-0-1 on the season. - UNB was 3 for 5 on the power play while the Tigers converted on 2 out of their 5 opportunities. - The Tigers won 44 of of the 82 face-offs in the game. - The three stars were Migardi, Wiggington, and Boes. - UNB has now won 18 consecutive games against the Tigers. - This is the most goals Dalhousie has scored in 25 games against the V-Reds, going back to a 6-3 win on November 27th, 2010. UNB has registered 8 shutouts in that span. - UNB had lost 7 of their last 8 games that had gone to a shootout since 2009. - It was a night of surprises around the league as Moncton scored 3 unanswered goals in the 3rd period to stun Saint Mary's 5-4 at home and UPEI went into Antigonish and broke open a 3-3 3rd period deadlock with 4 straight goals to pull away from St. FX 7-3. Acadia was idle. - UNB faces their toughest test of the young season tonight when they face the X-Men in an AUS and CIS Final rematch. Game time is 7PM. - After a 2-0-0 week the Varsity Reds earned 14 out of a possible 15 first place votes in the latest CIS men's hockey top 10 rankings to move into the top spot for the first time this season. This is the 93rd time in school history UNB has held the #1 ranking, second all-time to Alberta's 207. The St. FX X-Men, who will host UNB on Saturday night in a University Cup final rematch, received the other first place vote and fell to 2nd while Saskatchewan, Alberta, and UOIT round out the top five. Ryerson, UQTR, Mount Royal, UPEI, and Guelph hold down the 6th-10th spots. - Stephen Anderson has been named both the UNB Varsity Reds/Papa John's Pizza male Athlete of the Week as well as the Subway Atlantic University Sport male Athlete of the Week. Anderson scored what proved to be the game-winning goal in UNB's 3-1 victory over UPEI on Wednesday night before adding two goals and an assist in Friday's 9-2 win over Moncton. The 2nd year forward is off to a strong start his season, ranking 3rd in the conference with 7 points (3 goals, 4 assists) in his first four games. - Victor Findlay has posted his latest Tuesday Morning Skate in which he recaps the week that was in CIS men's hockey across the country. His thoughts and observations include naming Stephen Anderson one of his AUS stars of the week and calling the upcoming UNB/St. FX clash a "can't miss game", among other things. Hockey can be a funny game. The visiting University of New Brunswick Varsity Reds held a 17-6 shot advantage after the 1st period of play last night against the University de Moncton Aigles Bleus, yet trailed 1-0. They then scored five unanswered goals in the 2nd period, despite being out-shot 12-9, to take control of the game on their way to a convincing 9-2 road victory. UNB is now 3-0-1 on the season while Moncton drops to 0-3-0. The game got off to an inauspicious start for the V-Reds as Samuel Leblanc scored his first career AUS goal off of a rebound just 34 seconds into the game. UNB had constant pressure and numerous quality scoring chances - including a 37 second 5-on-3 - but were denied time and time again by Brandon Thibeau in the Aigles Bleus net. Unfortunately for Moncton, the opening twenty minutes was as good as it would get on this night. The V-Reds exploded for five goals in the middle stanza to basically put the game away. Scoring were Cam Braes on the power play at 0:29, Francis Beauvillier less than a minute later at 1:21, Chris Caissy on the power play at 12:37, Philippe Maillet at 13:09, and Stephen Anderson at 14:29. Moncton would pull within three goals with a power play goal 4:21 into the 3rd period, but UNB quickly regained the momentum with goals shortly after from Caissy at 5:43 and Jordan Murray, on the power play, at 6:44. The scoring was rounded out with Beauvillier and Anderson each getting their second goals of the night, at 11:43 and 15:53 respectively. Shots in the period were 21-6 for UNB. - Shots in the game were 47-24. - Francis Beauvillier replaced Oliver Cooper in the line-up, but otherwise UNB went with the same line-up as Wednesday with Christopher Clapperton, Cameron Brace, and Peter Trainor all remaining sidelined. - Alex Dubeau picked up his first win of the season in goal. - UNB went 3 for 8 on the power play while Moncton was 1 for 4. It was the first power play goal UNB has surrendered this season in 21 opportunities, becoming the last team in the AUS to be scored upon while shorthanded. - Chris Caissy (2 goals, 1 assist) was the player of the game. - UNB held a slight 42-40 advantage on face-offs. - The 24 goals UNB has scored through their first four games are the most since 2009-2010 when they tallied 29. - This is the 4th time in as many seasons UNB has scored 9 goals in a game against Moncton. - Other games around the league last night saw Dalhousie score a last minute goal to force overtime only to fall to Acadia 3-2 in Wolfville and Saint Mary's handing St. FX their first loss of the season 4-1 in Halifax. - The V-Reds are off tonight. They are back in action next weekend when they travel to Nova Scotia for games against Dalhousie on Friday night and St. FX on Saturday night. Although the University of New Brunswick Varsity Reds dominated the final 55 minutes of play, it took a 3rd period rally to overcome a sensational performance by UPEI Panthers goaltender Matt Mahalak in a 3-1 victory tonight at the AUC. UNB avenges a shootout loss to the Panthers five days ago to improve to 2-0-1 on the young season. The Panthers came out with lots of jump as they took the game's first six shots and jumped out to a 1-0 lead 5:39 into the contest when Gabe Guertler jumped on a loose puck just outside the crease and lifted it under the crossbar. This would prove to be the only goal through the first forty minutes despite UNB holding a 13-8 advantage in shots in the 1st period and a 13-3 edge in the 2nd period. The Varsity Reds upped the pressure even further in the final frame and were finally rewarded at 3:29. Jordan Murray received the puck from Philippe Maillet and his wrist shot from the blue line was deftly deflected out of the air by Philippe Halley, who was stationed in the high slot, with the puck fluttering up and over an unsuspecting Mahalak. Just over five minutes later, at 8:51, UNB took their first lead of the night when Maillet gained control of a Cam Braes pass through the slot, patiently out-waited Mahalak long enough to draw him out of position, and threw the puck between the netminder and the post through the crease. Stephen Anderson crashed the net and was able to get his stick on the puck first, banging it into the open cage for what turned out to be the eventual game-winning goal. The V-Reds were forced to kill off two late penalties before Chris Caissy sealed the deal with an empty net goal just milliseconds before the final horn sounded. Shots favoured UNB 21-4 in the period and 47-14 in the game. - UNB was without some of their key forwards as Christopher Clapperton (injury), Francis Beauvillier (serving a suspension due to fighting major last game), Cameron Brace (late scratch), and Peter Trainor (scratch) were all out. - Etienne Marcoux picked up the win in goal. Although not tested often he made a couple big saves to keep UNB within a goal. - The V-Reds penalty kill continued their strong start to the season as they held the Panthers scoreless on 7 opportunities. UNB was 0 for 3 with the man advantage. - The three stars were Anderson (GWG), Mahalak (44 saves on 46 shots), and Maillet (2 assists). - UNB dominated on face-offs, winning 43 out of 70. Cam Braes (14 out of 20) and Chris Caissy (9 out of 14) were the standouts. - The V-Reds have now won 9 straight home games versus UPEI. - UNB's next action will be Friday night when they travel to Moncton to face the Aigles Bleus. As always, AUStv.ca will be streaming the game live. Game time is 7PM. - Tomorrow night is also Residence Night. The UNB residence with the highest percentage of people in attendance will earn a $500 donation to their house charity as well as the 2016 Residence Hockey Night title. - The CIS has released their inaugural top ten rankings for men's hockey. The Varsity Reds garnered four first place votes and 107 points overall to begin the year ranked second behind the St. FX X-Men, who were awarded eight first place votes and 120 points. The rest of the top-five featured traditional powers in the Saskatchewan Huskies, Alberta Golden Bears, and UQTR Patriotes while teams ranked 6th to 10th featured some relatively new blood in the UPEI Panthers, Guelph Gryphons, Ryerson Rams, UOIT Ridgebacks, and Concordia Stingers. The Acadia Axemen and Saint Mary's Huskies were among eight other teams to receive votes. - Defenceman Jordan Murray has been named the UNB Varsity Reds/Papa John's Pizza Athlete of the Week after scoring four goals and adding an assist in two games last weekend. - Speaking of Murray, he was one of a handful of V-Reds to take part in an AUS commercial shoot today at a local Subway restaurant. The commercial will be airing on CTV in the near future. You can check out some "behind the scenes" pictures here. - UNB Hockey now has their own dedicated Facebook page. To commemorate the occasion they are giving away a game-worn Mike Thomas jersey. - Ryerson Rams commentator and CIS hockey writer Victor Findlay, who is quickly becoming the definitive source on all things CIS hockey, has started a new weekly series dubbed Tuesday Morning Skate. He will recap the week that was across all three conferences, which will include thoughts, standout performances, and key upcoming games. The University of New Brunswick Varsity Reds scored two power play goals in the late 10:03 of the third period to erase a 3-1 deficit, but ultimately fell 4-3 in a shootout to UPEI in the Panthers home opener tonight in Charlottetown. Defenceman Jordan Murray continued his torrid start offensively by opening the scoring with an unassisted tally with just 2 seconds remaining in the first period. The 1-0 lead would stand until 5:36 into the second period when Nelson Armstrong scored the first of three successive goals for the Panthers. Marcus Power gave UPEI their first lead of the contest just under two minutes later and former St. Thomas Tommies forward J.C. Campagna made it a 3-1 game at 8:35 of the third. The V-Reds pulled back within a goal when Murray (Maillet, Braes) struck again - his 4th goal in two games - just 82 seconds, setting the stage for some last minute heroics. UNB was awarded a power play with 1:21 remaining in the game and then pulled their goalie shortly after. After a scramble in front of the Panthers net Stephen Anderson (Braes) found the puck and batted it in with only 32 seconds left in regulation. The teams would skate through a fairly uneventful 3-on-3 overtime before heading to a shootout. Campagna was the first shooter up and found the back of the net and that proved to be the game winner as the next five shooters were all denied. - UNB went with the same line-up as last night with Christopher Clapperton, Chris Caissy, Peter Trainor, and Oliver Cooper all out. - Shots favoured the Panthers by a 33-31 margin. - Alex Dubeau took the loss in goal. - UNB was 2 for 7 on the power play while UPEI was 0 for 4. - This is the first time in four seasons UNB hasn't started 2-0. - This game was a sharp contrast to the 7-0 drubbing UNB laid on the Panthers in their pre-season opener last month, a game in which the Panthers were missing a number of key players. - In other action around the league tonight, Dalhousie beat Saint Mary's 3-1 and St. FX got past Acadia 4-1. - The V-Reds won't have to wait long to try and gain a measure of revenge as they welcome the Panthers to the AUC on Wednesday night. Game time is 7PM. 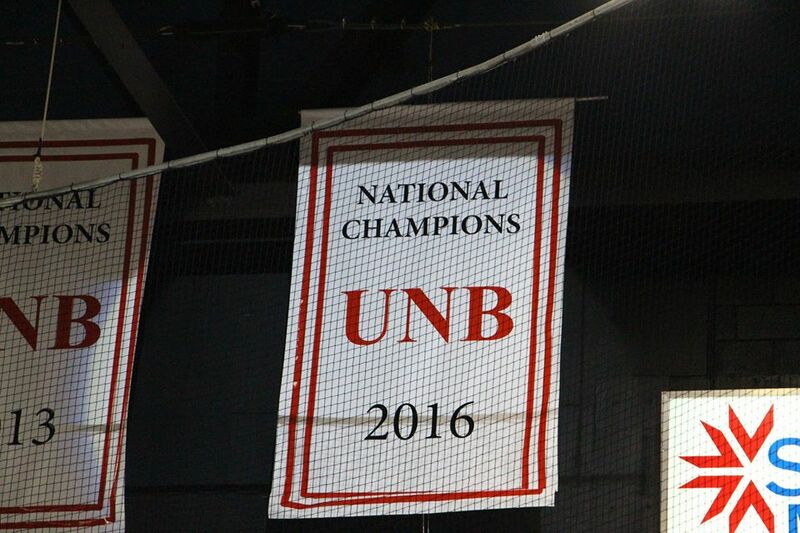 The University of New Brunswick Varsity Reds hung their 6th National Championship banner from the rafters and then went to work on defending it. The early returns are promising. The Varsity Reds scored on their first shot of the season and never let up, demolishing the visiting Universite de Moncton Aigles Bleus 9-0 tonight at the AUC to extend their impressive streak to 28 straight home opening victories. Reigning CIS defenceman of the year Jordan Murray (Simpson, Thomas), fresh off of a stint at Tampa Bays training camp, got the V-Reds off an running 2:31 into the contest when he beat netminder Brandon Thibeau with a shot from the top of the left face-off circle. Murray (Maillet, Beauvillier) would strike again at 6:46 when he took a pass just inside the offensive zone and was allowed to skate straight to the net without any resistance before flipping the puck over Thibeau's shoulder. UNB was then given a two man advantage and with the way they were playing on this night the result was unsurprising. Francis Beauvillier (Gazzola, Anderson) took a cross-slot pass and hammered it into the open net at 14:49, just seconds after the first penalty expired. The V-Reds would take the 3-0 lead into intermission, out-shooting Moncton 15-5 in the period. UNB would extend their lead to 5-0 in the second period. Cam Braes (Murphy, Thomas) got his first of the year at 8:35 after taking a stretch pass and skating in all alone before making a nice move to put the puck in. Mike Thomas (Beauvillier, Anderson) notched the V-Reds second power play goal of the night at 11:25 after he received the puck at the top of the crease with his back to the goal. Thomas fooled Thibeau after faking to his left before spinning around to his right and sliding the puck past the out of position goalie. UNB held a shot advantage of 17-5 in the period. The Aigles Bleus replaced Thibeau to begin the third period, summoning Alexi Thibaudeau to the crease. However, nothing would stop UNB on this night as they scored four more to close out the game with Randy Gazzola (Willick, Murphy), Philippe Halley (Gazzola, Murphy), Philippe Maillet (Murray, Anderson), and Marcus McIver (Willick, Thomas) - with his first as a V-Red - doing the honours. Shots were 13-4 in the period and 45-14 in the game for UNB. - Christopher Clapperton (injured), Chris Caissy (personal), Peter Trainor, and Oliver Cooper were all out of the line-up for UNB. - Etienne Marcoux got the start in net and was only challenged on a couple of occasions in picking up the shutout. It was UNB's 3rd straight shutout versus CIS competition to begin the year. They blanked UPEI and McGill 7-0 and 1-0, respectively, in pre-season play. - UNB was 2 for 3 on the power play. Moncton was 0 for 5. - UNB won 36 out of 63 face-offs in the game. Mark Simpson led the way by going 16 out of 23. - Mike Thomas (1 goal, 3 assists, +6) was the player of the game and first star. Jordan Murray (2 goals, 1 assist) was the second star and Matt Murphy (3 assists) was the third star. - Dylan Willick is a new alternate captain this season to go along with holdovers Rob Mignardi and Cam Braes. Cameron Critchlow, of course, will be the team captain for a 3rd straight season. - The V-Reds were sporting brand new white jerseys. The new threads are similar to the old ones with perhaps the most noticeable difference being the inclusion of red and black stripes just above and below the elbows. This is a similar design to their black jerseys. The old jerseys had one large red stripe and one large black stripe. - This is UNB's 6th straight season opening win as well as their 9th straight home victory over Moncton. - Elsewhere in the AUS tonight Acadia got past Saint Mary's 4-1 in Wolfville and St. FX beat up on Dalhousie 5-0 in Halifax. - The Varsity Reds are back at it tomorrow night when they travel to Charlottetown to face the UPEI Panthers in their home opener. Game time is 7PM and once again all games this season can be streamed live at www.AUStv.ca. The University of New Brunswick Varsity Reds dropped their second consecutive game south of the border, falling 3-1 to the NCAA's University of New Hampshire Wildcats this afternoon in Durham. UNB wraps up their pre-season schedule with a 2-2 record. After a scoreless opening period the Wildcats struck for a pair of power play goals in the second and another with a two man advantage early in the third. Randy Gazzola (Braes, Maillet) got the V-Reds lone goal on a 5-on-3 power play with 11:27 remaining, but that would prove to be the final goal of the game. - The Wildcats held a 34-25 shot advantage. - Alex Dubeau played the entire game in goal, making 31 saves. - UNB was 1 for 7 on the power play while UNH was 3 for 11. - The V-Reds won 25 out of the 43 face-offs in the game. - UNB was without the services of Francis Beauvillier and Jordan Murray due to their game misconducts last night against Merrimack. Christopher Clapperton, Matt Murphy, and Matt Petgrave were also out for unknown reasons. - With the pre-season over, the attention now turns to Friday night when UNB will host the Universite de Moncton Aigles Bleus in their home - and season - opener. Puck drop is scheduled for 7PM. Of course, the Varsity Reds will raise their 6th National Championship banner to the rafters before the contest. UPDATE: Merrimack doesn't sound too pleased with how the game unfolded. The University of New Brunswick Varsity Reds fell behind 4-0 after the first period, got within a goal after two periods, but ultimately fell 5-3 against the NCAA's Merrimack College Warriors tonight in a game that was marred by 172 minutes in penalties. - Scoring for UNB were Jordan Murray, with a pair, and Randy Gazzola. - Shots were 39-38 in favour of the Warriors. - UNB was assessed 107 minutes in penalties on 25 infractions. Philippe Halley, Philippe Maillet, Marcus McIvor, and Oliver Cooper all received 10-minute misconducts. Francis Beauvillier (hitting from behind) and Murray (contact to the head) took game misconducts while Etienne Marcoux (slashing) had a 5-minute major penalty. All three will most likely have to sit out tomorrow's game due to NCAA rules. - Marcoux went the distance in goal, surrendering 5 goals on 39 shots. - UNB was 2 for 10 on the power play while Merrimack was 2 for 13. - Neither Chris Clapperton nor Matt Murphy played. - The V-Reds continue their road trip tomorrow when they face the University of New Hampshire Wildcats at 5PM AST. - Charlie Cameron has been added to the coaching staff as an assistant coach. Cameron, who recently retired after three decades as a police officer, played for UNB from 1984 until 1986 and also served as an assistant coach for St. Thomas more than a decade ago. It is expected that Cameron will help out with the offense, in particular the face-offs. - According to the Varsity Reds Twitter account, Jordan Murray, Francis Beauvillier, and Matt Murphy are all on their way back from their respective NHL camps. It is unknown whether any will play this weekend. - UNB will travel to North Andover, Massachusetts on Saturday for a game against the NCAA's Merrimack College Cougars. Game time is scheduled for 8PM AST and it appears there will be video ($$), audio, and live stats available to follow along. The Cougars finished 7th in Hockey East last year with a 13-19-7 record and are predicted to finish 9th in the 12 team circuit this year according to the preseason coaches' poll. UNB and Merrimack have played once previously, with the Cougars emerging as 8-4 victors on October 7th, 2005. Stephen Anderson's shorthanded goal midway through the 3rd period was all the University of New Brunswick Varsity Reds needed as they topped the McGill Redmen 1-0 in pre-season play Saturday night in Montreal. The game was scoreless until 11:32 of the final period when Anderson took a pass from Mark Simpson and went in on a breakaway, beating Jacob Gervais-Chouinard for the only goal of the game. - UNB was still without defencemen Jordan Murray and Matt Murphy and forward Francis Beauvillier as they remain at NHL training camps. - Shots in the game favoured UNB 34-16, including 13-2 in the 3rd. - Both teams were 0 for 7 on the power play. - UNB is now 11-1-0 all-time against McGill. - The Varsity Reds have won 33 straight exhibition games - and 17 straight games overall - against OUA competition. - Gardiner MacDougall is 37-0-1 against OUA teams in exhibition games and 50-2-1 against them overall (exhibition + Nationals). - UNB has 27 consecutive victories over OUA East squads. to face a pair of NCAA teams. They face Merrimack at 8PM on Saturday night and then turn around to battle the University of New Hampshire on Sunday at 5PM. The defending CIS champion University of New Brunswick Varsity Reds picked up right where they left off in March as they dominated the visiting UPEI Panthers 7-0 tonight at the AUC. The V-Reds received a 1st period goal from Chris Clapperton before putting the game out of reach in the middle frame with power play goals from Stephen Anderson and Philippe Halley and even strength tally from Cameron Brace. UNB rounded out the scoring with another three goals in the final period courtesy Chris Caissy, Philippe Maillet, and Oliver Cooper. - Shots in the game were 32-14 for UNB with period totals of 10-4, 17-5, and 5-5. - Alex Dubeau and Etienne Marcoux split goaltending duties to share the shutout. Dubeau played the first 31 minutes, stopping 5 shots, while Marcoux saved all 9 shots he faced over the final 29 minutes of action. - UNB played without defencemen Jordan Murray and Matt Murphy and forward Francis Beauvillier. All three are currently attending NHL training camps. As a result, UNB played with only five defenceman tonight. - The Panthers were also missing a number of key players as their entire top line of Marcus Power, Brent Andrews, and Darcy Ashley did not dress. Sam Aulie, Casey Babineau, and Chad Labelle also sat out. - New V-Reds Oliver Cooper and Mark Simpson wore number 26 and 24, respectively. - Simpson won 13 out of 20 face-offs on the night. - The V-Reds were 2 for 6 on the power play. UPEI was 0 for 4. - No less than four of the goals UNB scored on the night were highlight reel-worthy. - UNB has now won 42 straight home exhibition games against CIS competition dating back to a 4-3 shootout loss to Saint Mary's on December 31st, 2005. - They have won 19 straight exhibition games overall against CIS competition. Their last loss was a 6-2 setback against Moncton on September 17th, 2012. - The V-Reds are back in action this Saturday when they travel to Montreal to face the McGill Redmen. Game time is 6PM. - The Varsity Reds announced today that former St. FX X-Men defenseman - and New Brunswick native - Trey Lewis will transfer to UNB. He will need to sit out the upcoming season before suiting up for the 2017-2018 campaign. Lewis has played the last two seasons in Antigonish, putting up 5 goals and 8 assists in 55 games. Prior to joining the X-Men he played parts of five seasons with the Halifax Moosehead. He was the team captain of the Mooseheads dominant 2012-2013 Memorial Cup-winning squad that featured NHL stars Nathan MacKinnon and Joanathan Drouin. - Defenseman Jordan Murray is one of 24 players to be invited to the Tampa Bay Lightning's prospect tournament. The tournament will be held in Coral Springs, Florida and will run from September 17th-20th. Francis Beauvillier (Columbus) and Matt Murphy (Winnipeg) will also be attending NHL camps this week. It is unknown how this will affect their availability during the first part of UNB's pre-season schedule. - Former V-Red Tyler Carroll has reportedly signed with the Gander Flyers of the CWSHL for the upcoming season. - Just a reminder that Varsity Reds season passes and University Cup tournament passes are now on sale to the general public. It is advised that you purchase University Cup passes well in advance as it is expected to once again sell out beforehand. - Fans will get their first chance to look at the 2016-2017 edition of the Varsity Reds one week from today when they host the UPEI Panthers in pre-season action. Game time is 7PM at the AUC.